I know. Hannah and I haven’t posted in a while. Our apologies on the recent radio silence. We had a number of serious personal events happen that have kept us away from Foodiologie. It may take a bit more time before we’re back on our regular posting schedule, but not to worry, we’ll be back soon. But enough about that, what of this locavore business? Eating fresh and eating local is one of the things that means a lot to us. What it often translates into is how and where we shop, and what we put in our grocery basket: trips to farmers’ markets, finding small grocers that carry local produce, or just selecting locally grown foods from some of the larger grocery chains. A lot of times though, eating fresh and local also means eating at a higher cost and greater inconvenience. But all this is about to change, because Pietro, aka my husband-to-be, and I are joining a food share program through Culinarium in Toronto. Food share programs are nothing new, but suprisingly, not too many people know about them, and even fewer participate. In reality, community food sharing is a significant part of human history. Only it’s far less prevalent in our big bustling cities, and complicated food production cycles nowadays – most of us are completely disconnected from the source(s) of our food. But we don’t have to be. Food share programs put our food and the farmers that produce it back into our frame of reference. What’s great about the Culinarium food share programs are that you can choose the program that best suits you: produce-only, meat options, or even an artisan option where you can also get locally-made cheeses and pantry items like maple syrups, mustards, and oils in both meat and vegetarian options. The other benefit is that it’s affordable. The only difference is that you’re paying for your food upfront and securing your personal portion of food with the farmers you’re getting your food from. The farmer has secure orders before the harvest, and you get a gorgeous assortment of seasonal, local food products on a weekly basis when the time comes. I can’t wait for my first basket. For other food share programs across Canada, Food Share has a listing here. If you’re not from Canada, look for one in your area. Chances are, you’ll find one. They’re more common than you may think. Good luck! 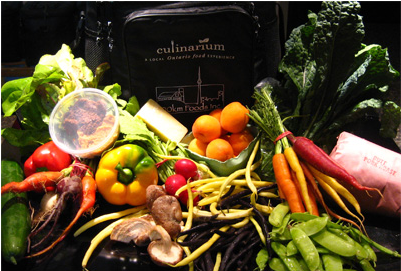 This entry was posted in General, Tips and tagged culinarium, food, food box, food share. Bookmark the permalink. There’s something about picking out your own gorgeous vegetables, isn’t there? On the other hand, when it’s all fresh and beautiful, I just love it all. We’ve been waiting to join one of these programs for the longest time, but were waiting for the next season to start. We didn’t know we could join anytime and prorate!